Why is Christianity Beholden to Babylonian Holidays of Christmas and Easter (Mythology)? Follow the Mammon, Follow the Great Whore, and Become Little Spiritual Whores? : "Come Out From Among Them And Be Ye Separate, Says YHWH"
Who Are The "Natsarim"; The "Christians"; The "Catholics"; The "Protestants"; The "Sabbatarians"? Yeshayahu Chapters 6-35: For I have Heard From the Master YHWH of Hosts, a Destruction Decreed Upon All the Earth. Give Ear and Hear My Voice, Listen and Hear My Word. Who Are The “Natsarim”; The “Christians”; The “Catholics”; The “Protestants”; The “Sabbatarians”? Who were the original followers of the Jewish Messiah? Was Christianity the original “sect” spoken of in scripture concerning the followers of Messiah? Who were the original Protestants? Were most of the early Christian “Church Fathers” antisemitic? Were the scripture translations afterwards tainted by Gentile Christians who sought to usher in Pagan “holidays” and shun Jewish festivals, persecuting Jews and all who didn’t follow their new teachings? Who are “Sabbatarians”? These questions and more will be answered below so that the Truth can finally be told — after so many years of continual falsehoods being told. I am going to start out by giving you scripture that will enlighten us all to what the name of the people who were the first followers of the Jewish Messiah, or “Mashiach” or “The Anointed One” were called. And did you notice that Paul was considered to be the ringleader of a sect called the Nazarenes (Natsarim)? I will be bringing up Paul’s name later as I discuss the Sabbatarians, who mostly detest — and even disavow — Paul’s testimony in scripture. The original Hebrew for “Nazarene” is based on the root “natsar,” which means to watch. And this is because the area around the burg Natsareth was named for it, hence the word “Gennetsaret” (vale of Netsar) referred to the whole district. This root word used points to the fact that the town was situated on high ground, which provided a panoramic view of the surroundings. The original followers of the Jewish Messiah were known as “Natsarim” (the plural of Natsari), as you saw above the “sect of the Nazarenes” written in your translations at Acts 24:5. The Natsarim were known to follow ‘The Way’ and were easily identified due to their use of the Name. The Name of the Heavenly Elohim was banned and forbidden to be used by those practicing Judaism. But the Natsarim used His Name regularly — as did Yahusha Messiah. They also did not teach the traditions of Judaism, which was referred to as the traditions of men. Revelation 12:17: And the dragon was enraged with the woman and he went to fight with the remnant of her seed, those guarding the commands of Elohim and possessing the witness of Messiah (The Natsarim). It seems that the “Hebrew” from the sect of the Natsarim is most likely pointing out YirmeYahu (Jeremiah) 31:5. The Catechetical School of Alexandria, Egypt and the “church fathers” who were trained and taught there, developed what ultimately became “Christianity,” and later Roman “Universalism,” Catholicism. What these early “church fathers” of Alexandria wrote about a certain “sect,” the Natsarim, may be of interest to those who actually want to trace back to their roots of their beliefs. Many of these early “Christians” were former sun-worshippers that adopted a belief in the Mashiach (Messiah) of Yisrael, Yahusha. They worked predominantly with Greek texts, yet from reading their Greek letters, we can quickly discern that they despised the ”Natsarim.” One of these Church Fathers’ indicated that these Natsarim possessed the writings of MattithYahu (Matthew), and stated that they were in Hebrew letters, as they had been originally written. These facts clearly contradict what most people today have been led to believe about the original followers of Yahusha. And due to the “Church Fathers,” the Hebrew/Yisra’elite roots of the faith were suppressed, and only the Greek roots were developed, written about and mostly followed. Please understand that it seems that the two most uniform traits among all the “Church Fathers” was their condemnation of the Natsarim, and their rabid anti-Semitism. Origen of Alexandria taught at the Catechetical School of Alexandria and succeed Clement as Head of the School. Origen lived from 185 to 254 CE and was self-castrated and a vegetarian, like Clement. Tertullian and Irenaeus were contemporaries of Orign, and were Classically Educated in Paganism, and error was adopted. “And we think it right to hear from you what you think, for indeed, concerning this sect, we know that it is spoken against everywhere.” (ACT 28:22). IRENAEUS was a mid-2nd century “Church Father” who held that the bishops provided the only safe-guard against false interpretation of Scripture, which laid the groundwork toward papal primacy. Also, in his battle against Gnosticism, and in the interest of unity, he maintained that Doctrinal Authority had to be solely established by Episcopal “Councils.” “Episcopal” means ‘Governed by Bishops,’ and this laid a foundation for later Nicolaitanes and a hierarchical chain of command, culminating in the fascism known as the Roman Catholic Church. Catholic means “universal” in Latin, so Irenaeus’ vision for Unity of Doctrine did actually become a reality. And for centuries after the resurrection of Yahusha, false teachers arose to draw away disciples after themselves, just as Shaul (Paul) predicted would occur in Acts chapter 20. Epiphanius is informing us that the Nazarenes were different from what he called the “Christians” and “Jews,” and since he lived three hundred years after Yahusha Messiah arrived, the “Nazarenes” and the “Christians” could ONLY be TWO SEPARATE GROUPS at that time! And by this he means that the “Nazarenes” — and NOT the Catholics — are the DIRECT, spiritual DESCENDANTS of the Apostles of the New Covenant!!! And the very first Believers in Yahusha were called ‘The Way‘ (comes from ( John 14:6/ Acts 9:2, 19: 9, 23, 22:4 and 24:22). “Christianity,” in its modern form, it seems was likely started by Simon Magnus (Simon the Magician), who is mentioned in Acts Chapter 8, and who attempted to purchase the power of Elohim, and is actually buried under the altar of “St. Peter’s Cathedral” in Rome. ”Christianity” was later made the Official State Religion of Rome by Constantine. In fact, the Vatican is the Great Whore spoken of in scripture. ”Christianity” was certainly not started by “Saint Peter”, Paul, or Yahusha Messiah. And did you know that there were “Christians” before the Natsarim were started by Yahusha? Followers of Serapis (a Pagan sovereign) in 300 B.C. were known as “Kristianos.” The Greek term Chrestoi means “good men,” which was applied to the followers of Sarapis for three centuries before Yahusha Messiah arrived. (From Serapis dictionary entry: [There those who worship Serapis are, in fact, Christians, and those who call themselves bishops of Christ are, in fact, devotees of Serapis.]) It is a fact of language that the term “Christian” simply means cretin, idiot, stupid, mentally defective. “For we have found this man a pestilent fellow, and a mover of sedition among all the Yahudim throughout the world and a ringleader of the sect (G139, hairesis) of the Nazarenes (G3480).” The Greek word hairesis above gives us our word “heresy” translated “sect.” So we know the “sect” being spoken of was not the Christians, because Christians developed later. The word christianos was used twice in the Greek text as a device of scorn, since in the ancient world it conveyed a much different sense than it does today. The use of the word christianos did not “name” the sect, but it was a derisive, scornful label that meant they were like gullible, dumb beasts, or “cretins”. 1. A person afflicted with cretinism. Copyright © 2009 by Houghton Mifflin Company. Published by Houghton Mifflin Company. The word “watchmen” is the Hebrew word NATSARIM, and means guardians, protectors, preservers, and also means “branches”, as in “descendants”. Immediately, we see the connection with Yahusha’s words about Him being the Root, and His students the “branches,” the off-spring of His teachings. The name by which most Believers are called has no Greek roots; the Hebrew roots of our name are profound. When we become saved, we enter a Covenant, which is a marriage between YHWH and Yisra’el, His bride. Yisra’el is the only “denomination,” and the Natsarim are an elect group within Yisra’el, as they are called by Yahusha as workers in His up-coming harvest of mankind to become Natsarim (Believers in The Way of Yahusha ‘Mashiach’; Taught Ones of The Way of Yahusha ‘Messiah’; Brethren of The Way of Yahusha ‘The Anointed One’ or ‘Redeemer’ or ‘Savoir — but NOT ‘Christ’). We are Gentiles and Hebrews. We are all grafted into Yisra’el. Natsarim, or followers of Yahusha, are those who “obey Yahuah’s Commandments and hold to the testimony of Yahusha” (Rev 12:17). Natsarim are watchmen (Natsarim, Acts 24:5, Jer. 31:6 meaning also branches), and consider all Believers to be on the path to redemption through repentance, immersion in the Name of Yahusha, and obedience to the Covenant of Yahusha, through the Set-Apart-Spirit of Elohim. We are to believe in the Name of Yahusha Messiah and become immersed under water in His Name to receive remission of sin and receive the Set-Apart Spirit of Elohim. Then we are to live as a new creature in Yahusha Messiah to be set-apart from sin and to to good unto all men – and even our enemies as we can — and especially to love the Brethren in Messiah Yahusha, as we try to love YHWH with all of our heart, soul, mind and strength until out last breath. Martin Luther is credited by Christians as the leader of the Reformation Movement, so let’s only look at only a SMALL (for lack of space) portion of his antisemitism writings. “What then shall we Christians do with this damned, rejected race of Jews? Since they live among us and we know about their lying and blasphemy and cursing, we can not tolerate them if we do not wish to share in their lies, curses, and blasphemy. In this way we cannot quench the inextinguishable fire of divine rage nor convert the Jews. We must prayerfully and reverentially practice a merciful severity. Perhaps we may save a few from the fire and flames [of hell]. We must not seek vengeance. They are surely being punished a thousand times more than we might wish them. Let me give you my honest advice. “First, their synagogues should be set on fire, and whatever does not burn up should be covered or spread over with dirt so that no one may ever be able to see a cinder or stone of it. And this ought to be done for the honor of God and of Christianity in order that God may see that we are Christians, and that we have not wittingly tolerated or approved of such public lying, cursing, and blaspheming of His Son and His Christians. “Secondly, their homes should likewise be broken down and destroyed. For they perpetrate the same things there that they do in their synagogues. For this reason they ought to be put under one roof or in a stable, like gypsies, in order that they may realize that they are not masters in our land, as they boast, but miserable captives, as they complain of incessantly before God with bitter wailing. “Thirdly, they should be deprived of their prayer-books and Talmuds in which such idolatry, lies, cursing, and blasphemy are taught. John Calvin, who believed in “predestination,” was also antisemitic. And “predestination” means that if one is going to enter Hell or Heaven, they have already been preordained, and nothing can be done about it. Excerpt from “Ad Quaelstiones et Objecta Juaei Cuiusdam Responsio,” by John Calvin; The Jew in Christian Theology, Gerhard Falk, McFarland and Company, Inc., Jefferson, NC and London, 1931. Origen of Alexandria (185-254 A.D.) — A ecclesiastical writer and teacher who contributed to the early formation of “Christian” doctrines. The Inquisitions (Roman, Medieval, and Spanish) were perpetrated upon the Peoples of Europe, with an estimated 3 million murdered and about 300,000 burned at the stake in Spain alone. In 1096, Pope Urban II was the impetus of the first crusade to retake Jerusalem from the Muslims, with one of the Crudaders’ first acts upon taking Jerusalem “for Holy Mother Church” was to put the Jews into a synagogue and set it on fire. Here is a list of instances where Christians expelled the Jews in line with the teachings and exhortations of the Catholic Church. Here we have the Vatican conducting beatification of Pope Pius IX, a deeply ingrained antisemitic within the Catholic Church, who reigned from 1846 to 1878, and was beatified by Pope John-Paul II on September 3 in a ceremony attended by thousands of pilgrims in St Peter’s Square in 2000. In fact, the Vatican is the “Great Whore” spoken of in scripture. Here are the “Religious Luciferian Symbols” the Vatican uses. Here is the history of the sign of the cross and it’s idolatrous usage by the Vatican. Note that the Isra’elites carried along their idols from Egypt, with the women wearing earrings and other jewelry — which was almost always an image of the “sovereign” or “sovereignness.” These women had spent 400 years worshiping Osiris, which was pictured as a tiny or large golden calf. Apis was the beast-sovereign of ancient Egypt, and was also known as Mnevis and Onuphis. This Apis / Mnevis / Onuphis (Apis) was regarded as the avatar or Incarnation of the god Osiris, whose soul, it was said, had transmigrated into the body of a bull. 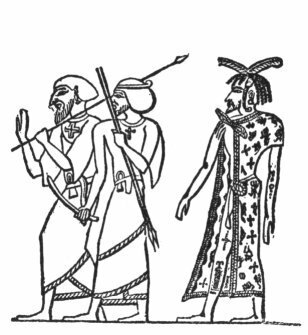 To identify Tammuz with the sun it was joined sometimes to the circle of the sun as in figure on left; sometimes it was inserted in the circle, as in figure on right. and was the unequivocal symbol of Bacchus, the Babylonian Messiah. 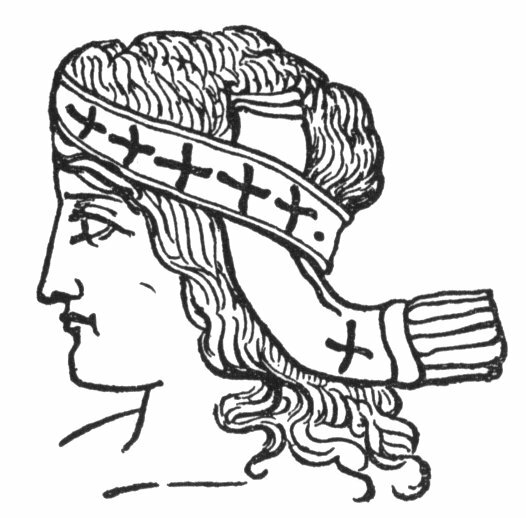 He is represented with a head-band covered with crosses in the above figure. “From a Biblical perspective the Greek word stauros denotes an ‘upright stake’…– not a cross — agreeing with the Aramaic [Peshitta text-The Messiah] was put on an upright stake, not ‘cross-ified.’”(Andrew Gabriel Roth, Aramaic English New Testament, app., p. 916, 76). “The Greek word stauros means staff, stake , pole, or beam, corresponding to the Hebrew word nas, which the serpent Nehushtan was lifted up with in the desert (John 3:14, Numbers 2:19; 2 Kings 18:4).” (Lew White, Fossilized Customs, 8th ed., p.114). Cardinal Newman lists many examples of things of “pagan origin” which the papacy brought into the church “in order to recommend the new religion to the heathen: “in order to recommend the new religion to the heathen:” “The use of temples, and these dedicated to particular saints, and ornamented on occasions with branches of trees; incense, lamps, and candles; holy water; asylums [hermitages, monasteries and convents]; [pagan] holy-days, processions, sacerdotal vestments, the tonsure, the ring in marriage, turning to the East, images, . . . and the Kyrie Eleison.” — Cardinal J. H. Newman, An Essay on the Development of Christian Doctrine, 1920 edition, p.373 [Roman Catholic]. “The [Catholic] Church took the pagan philosophy and made it the buckler of faith against the heathen. She took the pagan Roman Pantheon, temple of all the gods, and made it sacred to all the martyrs; so it stands to this day. She took the pagan Sunday and made it the Christian Sunday. She took the pagan Easter and made it the feast we celebrate during this season . . . The Sun was a foremost god with heathendom . . . The sun has worshipers at this hour in Persia and other lands . . . Hence the Church would seem to say, ‘Keep that old pagan name [Sunday]. It shall remain consecrated, sanctified.’ And thus the pagan Sunday, dedicated to Balder, became the Christian Sunday, sacred to Jesus” — William L. Gildea, “Paschale Gaudium,” in The Catholic World, 58, March, 1894, p. 809 [A Roman Catholic weekly]. “in order to recommend the new religion to the heathen:” “The use of temples, and these dedicated to particular saints, and ornamented on occasions with branches of trees; incense, lamps, and candles; holy water; asylums [hermitages, monasteries and convents]; [pagan] holy-days, processions, sacerdotal vestments, the tonsure, the ring in marriage, turning to the East, images, . . . and the Kyrie Eleison.” — J. H. Newman, An Essay on the Development of Christian Doctrine, 1920 edition, p.373 [Roman Catholic]. Don’t you remember the warning from 2 Timothy about a time that would come when people would not seek sound teachings? Sabbatarians are those that call themselves “Natsarim,” and who observe Jewish holidays, but trust in the Torah for their salvation, and also keeping a watered-down version of Sabbath Day “rest,” rather than the trusting in the finished work of Yahusha at Calvary. They have an almost universal disdain of Paul, who was commissioned to the Gentiles by none other than Yahusha the Messiah, to preach the Truth to. Remember, it was Paul who rebuked Peter for trusting in the Torah and it’s circumcision and other requirements, rather than in Messiah, and said that those who did this were “fallen” from grace. As we can see above, no flesh shall be saved obeying the Torah, which the Sabbatarians don’t even fully obey, anyway, their hypocrisy evident to everyone who knows the truth of scripture. And besides this, many Sabbatarians who call themselves “Natsarim,” only believe that the Son is the Father and the two are the same, which clearly the scriptures do not teach in the new or old covenants. Imagine the Son having an imaginary conversation with himself as the Father? This is nonsensical to me. connected to the “first” follwers of the NATSARIST. them (not perfect mind you). Seventh Day Sabbath, SetApart Days,etc. do really appreciate what you have compiled. is copying whom and I do not know whom is doing the copying. Again, thanks for your very helpful articles. by the church “fathers”, etc. shall keep, on and on. who was being copied, now we know. doing the 7th day Sabbath?, Were called Judahizers? Laws of Moses? and any other derogatory term the unbelievers could conjer up? will correct any and all errors. Peace, and well wishes to you and yours. Notice a little more explanation on our “not perfect” comment required. the shed blood of our Saviour Yahusha and His Name. being “Judahizers”, and Sabbath keepers, and law. YOU say they were WRONG? they didn’t know what they were doing? Unversal Church and her daughters ever since. perfectly. Didn’t he keep Sabbaths, eat Kosher food? keep Holy Days? Are we not to “walk as He walked”, “Follow Me”, on and on. Ruach, to be our helper, comforter, truth leader, sanctifier, on and on. Thank again, have a good day. I totally agree with you L.G., I call myself a Puratim,(sorry for the mis~ spelling) I keep the Sabbath, I keep the 10 Commandments, As YHWH said BE PERFECT as I AM PERFECT, We are to strive to be perfect, Am I perfect LOLL hardly, but Im not going to stop striving to live as Yahusha has taught us to live, putting others before ourselves and loving even our enemies, Yahusha as you said told us Himself that He did not come to do away with His Abba’s laws but to fullfill them, What He did away with were the Levitical laws, He was the LAST Sacrifice. Amen!! All Praise and Glory to Him who was and IS and is Coming again soooo soon! Blessings and Thank you Mr.777Denny, for the though history on the RCC which i knew most of, The only thing that keeps me out of the Adventist Church is the teachings of Mrs.White, (nothing wrong with Mrs.White), It reminds me od the Mormons Joseph Smith. and Islams Mohamadd., Nothing new under the sun. I would like to hear more on the Natasarim and how they differ from the Christian of today; how Yeshuah differed from todays christian as well as Jews, not Zionist nor neo-con sympathizers. Would you please provide clarity . Thank you Larry.